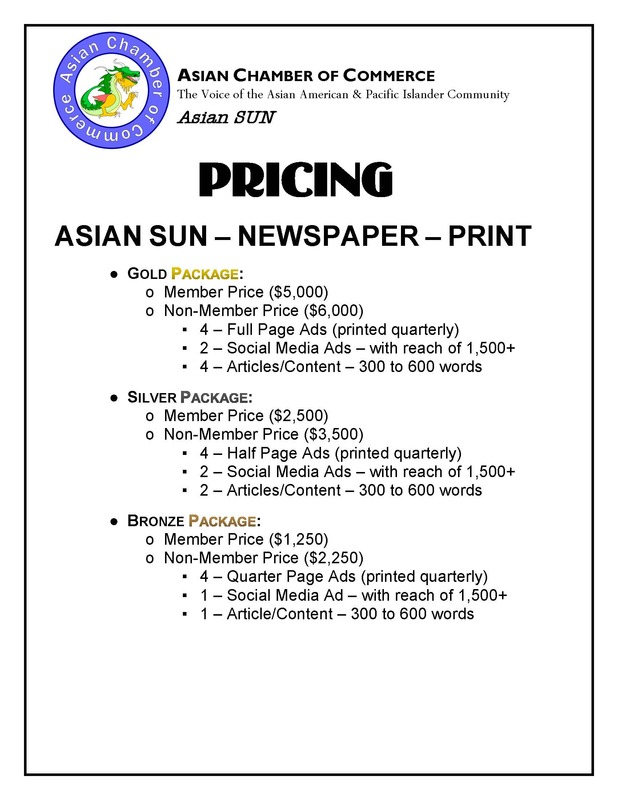 The Asian Sun News has been one of the most pivotal publications of the Arizona Asian American and Pacific Islander Community. Madeline Ong-Sakata along with the Arizona Asian Chamber of Commerce has always understood the importance and necessity of relying information to our community. The Asian Sun News has produced 50,000 print copies annually with a tremendous reach to local corporations, businesses, governmental entities, and educational institutions. Since the Asian Sun News was on hiatus, we are happy to announce that we have revamped the Asian Sun and will continue printing quarterly. We will continue with Madeline Ong-Sakata's passion to educate and distribute information to our communities – and to ensure the overall populace is aware of the Asian American and Pacific Islander community. The Asian Sun News contains content from elected officials, professors, scholars, entrepreneurs, community leaders, and giants of industry. With your support we know that we can continue achieving success. We are looking forward to developing a relationship with you and the Chamber.